We’d love your help. 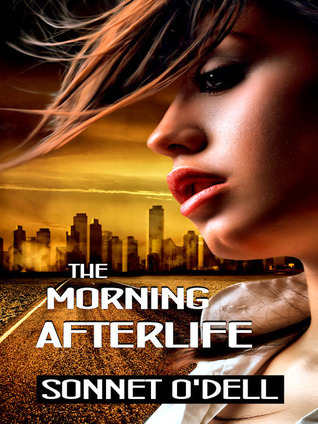 Let us know what’s wrong with this preview of The Morning Afterlife by Sonnet O'Dell. To ask other readers questions about The Morning Afterlife, please sign up. This short novella tells the story of a young woman who wakes up disorientated and with amnesia, alongside a road. She remembers her name, but everything else is lost to her. Walking down the road, she comes to a town that seems somewhat familiar to her and meets a small group of people in the otherwise deserted town. The group takes her in, warning her to be careful because there is another mysterious group whose aim seems to be to kidnap vulnerable, careless survivors. This is a haunting, beaut This short novella tells the story of a young woman who wakes up disorientated and with amnesia, alongside a road. She remembers her name, but everything else is lost to her. Walking down the road, she comes to a town that seems somewhat familiar to her and meets a small group of people in the otherwise deserted town. The group takes her in, warning her to be careful because there is another mysterious group whose aim seems to be to kidnap vulnerable, careless survivors. This is a haunting, beautifully rendered tale that throws a solid punch at the end. I wish it had been longer and fleshed out with more character back story, but that is just because Sonnet never fails to amaze me with her creativity and imaginative subject matter. I did not want the adventure to be over. Pick up this bittersweet story and discover for yourself Sonnet’s gift of fluid prose. Sonnet lives in Worcester, Worcestershire, famous for Lea & Perrin’s Sauce and as the site for the last battle of the Civil War. It is also home to the Cassandra Farbanks Series. Sonnet has had a passion for the written word from a very young age and enjoys nothing more than to read a good book. The worlds created by words.